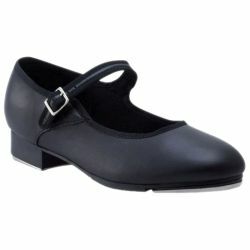 The Mary Jane style dance shoes with taps are perfect for tap dancing routines where a look of simplicity is desired. The Mary Jane adult dance shoes with taps features a micro rubber outsole, a foam insole, cotton sock and hung lining, a scorn rubber non-skid pad, a non-slip heel counter, wide leather buckle strap closure, a harder micro rubber heel, and attached TeleTone toe and heel taps. The shoes are available in black adult woman's shoe size 3 – 11. Order your street shoe size.